Nanopartz has developed a gold nanoparticle construct that has shown efficient cell transfection and uptake into cell nuclei, specifically targeting PML bodies. 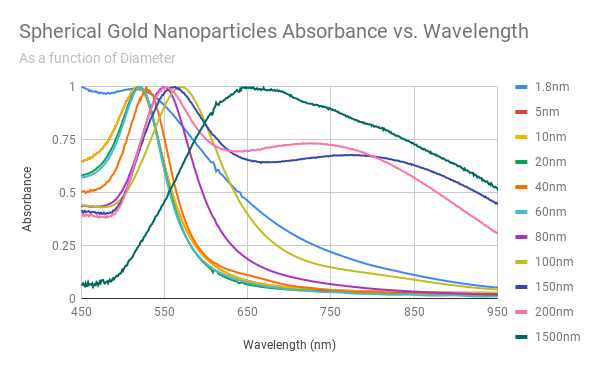 These gold nanoparticles have diameters from 1.8nm to 3nm and can be imaged by either confocal fluorescence or electron microscopy. Most importantly, they are large enough that they don't need to be grown through silver or gold growth methods after the fact as post treatments are known to destroy cell ultrastructure. These products show the potential for drug and oligo delivery to cell nuclei. Every batch is completely characterized including size, monodispersity, aggregation, residual chemicals, and concentration. A Certificate of Analysis (COA) is provided for every order exhibiting TEM and UV-VIS images and data, as well as DLS data. Every product is in stock (99%) and is shipped same day. This product comes one concentration, OD=25 (1.25mg/mL) in 18MEG DI water (default), purified of residual reactants to <0.1%. In the Product List Tab below, click on the product part number for current lot specification sheets. These spherical gold nanoparticles are shipped in DI water with no measurable residual reactants. Diameters 1.8nm to 3nm. Larger sizes may reduce nuclear uptake. Please contact us. This product is available in 1mL volumes and larger. For orders larger than 1L, or for orders amounting over 10L per annum, please contact sales for quantity pricing. This product comes with a number of Frag' IgG functionalizations with a complete range of fluorophore choices. What are Nuclear PML bodies? PML nuclear bodies (NBs) are spheres of 0.1–1.0 µm in diameter found in most cell-lines and many tissues. They belong to the nuclear matrix, an ill-defined super-structure of the nucleus proposed to anchor and regulate many nuclear functions, including DNA replication, transcription, or epigenetic silencing. The PML protein is the key organizer of these domains that recruits an ever-growing number of proteins, whose only common known feature to date is their ability to be sumoylated. PML and NBs were proposed to fine-tune a wide variety of processes, through facilitation of partner protein posttranslational modifications resulting in partner sequestration, activation, or degradation. Several NBs subtypes have been defined on morphological bases, which all contain an electron-dense shell and an inner core. Why are you able to get high efficiency nuclei uptake with such large gold nanoparticles? Two reasons: 1) the monodispersity of our gold nanoparticles and 2) the ligand design construct. Our ligand design has reduced the overall size of the construct, making it more efficient at nucleus uptake. Accurate to +/- 2 nm in diameter. Size monodispersity better than 4% CV for many sizes. Carboxylic acid capping agent is reduced to < 0.1% without adverse effects to the spheres. Reduced number of additives improves binding to antibodies, receptors, ligands and DNA. Accurate™ SGNPs do not photobleach. No photobleaching means better diagnostic labels with the ability to archive. 25 - Volume (mL). Other choices are 1mL, 10mL,100mL, 500mL, 1L, 10L. Part Number Format: PNU11-(DIAMETER)-(FLUOROPHORE)-(FUNCTIONALIZATION)-(OD)-(VOL)-(CS)-(EP)-(NR); where Diameter = 1.8, 2.2, or 3nm. Fluorophore is from 405nm to 680nm. Functionalization = GAMG, GARG, GAHG, or Neutravidin. OD=25. Volume = 1 or 5mL, CS= Optional Certified Sterilized, EP = Optional Endotoxin Purified, NR = Optional Non reactive Control. Sample Part Number is PNU11-1.8-FITC-GAMG-25-1.